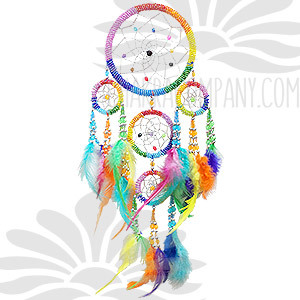 Dream catchers are arts and crafts of the Native American people. Dream Catchers were woven by the grandfathers and grandmothers for newborn children and hung above the cradleboard to give the infants peaceful, beautiful dreams. The night air is filled with dreams. Good dreams are clear and know the way to the dreamer, descending through the feathers. The slightest movement of the feathers indicated the passage of yet another beautiful dream. Bad dreams, however, are confused and confusing. They cannot find their way through the web and are trapped there until the sun rises and evaporates them like the morning dew.